The Prospect T1 is a cost effective high-frequency preclinical ultrasound system for mice, rats and other small animals, optimized to study the hemodynamics and vascular function at the laboratory benchtop instead of from inside a core imaging facility. It produces high resolution images, with spatial resolution up to 30µm, and provides exquisite details of anatomical structures. S-Sharp has been providing cutting edge ultrasound technology for many years, with a strong research and development team of engineers. The Prospect T1 is the first tablet based ultrasound system on the market, drastically reducing its footprint within the laboratory environment. With its touchscreen user interface, streamlined workflow and compact design the system is well equipped to provide real-time imaging to meet the needs of a variety of preclinical researchers. The Prospect T1 has been specifically designed for preclinical imaging of small animals including mice and rats. These species require very high resolution images (up to 30µm) to observe anatomical structures, and considerations to monitor changes in hemodynamics due to their high heart rates. 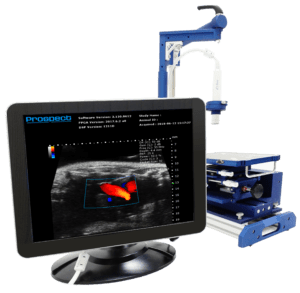 This tablet based, high frequency, compact ultrasound system is a cost effective alternative to other preclinical ultrasound systems on the market, allowing individual labs to harness the power of this real-time imaging modality. The system is well equipped with standard ultrasound capabilities including B-mode, M-mode, Color and Power Doppler, Pulsed Wave Doppler, Tissue Doppler, and Contrast imaging (reference subtracted and harmonic options are available). Additionally the system’s capabilities may be expanded by adding on a 3D motor to acquire 3D B-mode images, integration of a sonoporation probe for use with microbubbles, or push probe to perform shear wave elastography, and finally an integrated injection mount can also be used to aide in image guided injections. 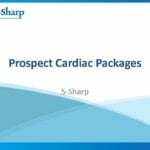 The standard configuration and capabilities of the Prospect T1 allow for researchers with a wide variety of research interests to utilize the system; these applications include cardiovascular research, cancer biology, general abdominal/anatomical imaging, developmental biology, as well as ophthalmology applications. The suite of analytical tools and measurement packages allow imagers to quickly generate quantitative results over the course of their longitudinal studies. Included with the system is the scanning platform which may be equipped with either a heated mouse or rat sized bed, which has integrated physiological monitoring. This platform has been ergonomically designed to allow for easy positioning of the ultrasound probe, while being easy to clean as needed between imaging subjects. Currently there are two different single element probes available, the choice of which to use is dependent on the animal to be imaged and the anatomical targets. The PB406e probe has a user selectable broadband frequency of between 30 – 50 MHz, with its main application being for mice and superficial imaging targets on other species. The PB207e probe ranges in frequency from 15 – 30 MHz, which again is user selectable, with its main application for rats and harmonic contrast imaging. The system operates using a touch screen tablet, the user interface has been designed with the pre-clinical researcher in mind. Animal and study information can be entered at the start of an imaging session and is associated with all of the saved images. Depending on the imaging application the data may be saved in a RAW format if the raw radio frequency data is required, or cineloop format for further measurements and analysis. Additionally, there are options to simply save tiff/jpg/bmp images or avi files for presentation. Offline data analysis is also available to ensure that the system time is reserved for image acquisition, while data can be transferred to an analysis station to perform measurements as needed. 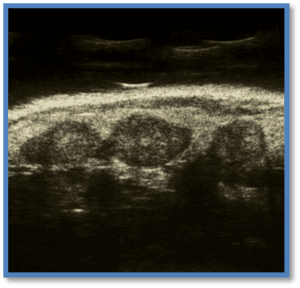 B-mode (brightness mode) is a two dimensional grey scale image which is displayed in real time once the probe is in contact with the ultrasound gel placed on the imaging target. Anatomical targets such as the beating heart, abdominal organs, tumors, muscles, developing embryos, etc. can be visualized and measured using this mode. M-mode (motion mode) is a one dimensional grey scale image which is used to assess motion of a specific target, i.e. the heart, along a single line. Dimensional changes, as the myocardium moves, can be made with this very high frame rate image. The sample volume is placed on a 2D B-mode image which can be live updated at any point during image optimization. Color Doppler is a technique used to overlay a heat map of blood flow over a 2D anatomical B-mode image. The directionality and velocity of the blood flow is displayed in varying colors of blue and red; blood traveling away from the probe appears in shades of blue, while the blood traveling towards the probe appears in shades of red. Color Doppler images can be used identify vasculature, and to aid in the sample volume placement for pulsed wave Doppler analysis. and left subclavian artery (LSCA). Power Doppler is a technique used to overlay a map of blood flow over a 2D anatomical B-mode image. The Power Doppler signal does not provide information on directionality, but velocity is shown as shades of orange. 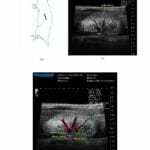 This imaging mode is traditionally used to aid in the visualization of overall vascularity in specific anatomical target, i.e. tumors. PW Doppler is used to measure blood flow velocity as a function of time, and is displayed as a spectrogram. The sample volume for this mode is typically placed on a Color Doppler image, this image can be live updated at any point for image optimization and sample volume placement. In PW Doppler the user has the option to assign an angle correction to the spectrogram data to ensure accurate velocity values are displayed. This angle should be minimized where possible, by adjusting the angle of the probe, to ensure accurate and reproducible measurements. Mouse tricuspid valve flow velocity spectrogram. Tissue Doppler, like PW Doppler, displays a spectrogram over time, however with Tissue Doppler the measurement is being made on the tissue velocity not blood. The sample volume is traditionally placed over the annulus of a valve leaflet, i.e. the mitral annulus, to measure the movement of the tissue in this area. The sample volume for this mode is placed on a 2D B-mode image which can be live updated at any point during image optimization. Contrast mode is used detect the presence of microbubble contrast agents, typically injected intravenously into the imaging subject. There are two acquisition techniques available: reference subtracted, and harmonic imaging. In reference subtracted images a “reference” 2D B-mode image is acquired prior to the injection of the contrast agent. This is then subtracted from the cineloop in which the contrast agent was injected. The subtracted image, representing the injected contrast agent, is colored green and overlaid on the original cineloop. This is possible with either the PB406e or PB207e probes. Using the harmonic imaging technique first a standard B-mode image is acquired to understand the anatomical structure being imaged. Once in harmonic imaging the system will display only the harmonic signal and most of the anatomical structures will be lost. As the contrast agent is injected the microbubbles will return a strong harmonic signal as they enter and pass through the imaging plane. This technique is possible only with the PB207e probe. 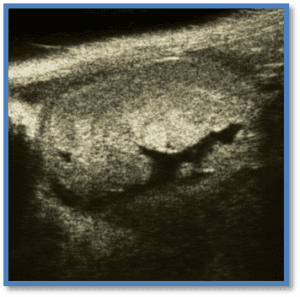 Microbubble contrast imaging in a mouse subcutaneous tumor. Reference subtracted imaging. Ultrasound is used routinely for cardiovascular imaging, providing real-time imaging of the heart and large number of vascular targets. B-Mode images proved a 2D or 3D image of the heart or blood vessels, and may be used to measure cardiac function or changes to the vasculature. M-Mode imaging provides very high frame rate images of the movement of the heart, or vessel, along a single imaging line. The Prospect T1 provides measures of cardiac function from either B-mode or M-mode images including ejection fraction, fractional shortening, end diastolic volume, end systolic volume, wall thickness, etc. Color Doppler is used to assess vascular flow as well as blood flow within the heart, providing a visual representation of the direction of flow and flow velocity. PW Doppler provides a spectrogram of the blood flow velocity for a specific sample volume, often placed on the Color Doppler image. PW Doppler may be used on valves within the heart, larger blood vessels, as well as some peripheral vasculature. Tissue Doppler provides a spectrogram of the tissue velocity, most often at the mitral or tricuspid valve annulus. These measurements have been used as an early indication of change, as it is felt that changes in tissue velocity precede measureable changes is blood flow velocity. The Prospect T1 provides measures of systolic function including cardiac output; measures of diastolic function including E/A ratio, isovolumic relaxation and contraction times (IVRT, IVCT), Tei index; blood flow velocity measures; and peripheral vascular function measurements. Due to the non-invasive nature or ultrasound imaging, longitudinal studies may be conducted on the same animal to monitor cardiovascular disease progression, or to study therapeutic efficacy. Image guided needle injection may be of interest to cardiovascular researchers hoping to inject cells, therapies, or other compounds into very specific anatomical structures or specific vessels. For example, injecting stem cells into the myocardium to aid in the repair of myocardial infarction. B-mode imaging can be used to identify, count, and quantify tumors in a variety of tissues. Orthotopic, xenograft, and transgenic tumor models can all be imaged using the Prospect T1 system, depending on the anatomical location of the tumor. Tumors are visible in any number abdominal organs, muscles, or those implanted subcutaneously. 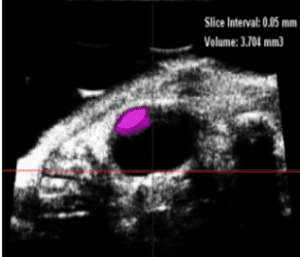 Both 2D and 3D B-mode images can be used to measure tumor size. Power Doppler images may be used to assess the vascularity of tumors. Contrast imaging can be used to assess microvascular flow, or targeted microbubbles may be used to detect specific molecular targets. 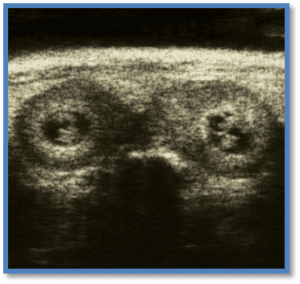 Due to the non-invasive nature or ultrasound imaging, longitudinal studies may be conducted on the same animal to monitor tumor progression, or to study therapeutic efficacy. Image guided needle injections may be of interest to some researchers hoping to inject tumor cells into a very specific anatomical target with higher accuracy. Sonoporation may be of interest to those studying drug and/or gene delivery in cancer research. Shear wave elastography may be of interest to those studying the mechanical or elastic changes associated with cancer lesions. B-mode imaging can be used to image many of the abdominal organs, including liver, gallbladder, kidney, spleen, pancreas, etc. Additionally, the ovaries, prostate, other urogenital and musculoskeletal targets can be visualized in either 2D or 3D B-mode. 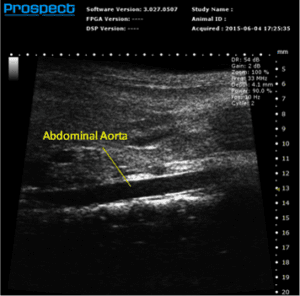 Color and Power Doppler may be used to assess the vascularity within the abdomen and specific organs, while PW Doppler may be used to quantify blood flow velocity in some of the larger vessels. Contrast imaging can be used to assess microvascular flow, or targeted microbubbles may be used to detect specific molecular targets within a variety of abdominal and musculoskeletal targets. Due to the non-invasive nature or ultrasound imaging, longitudinal studies may be conducted on the same animal to monitor anatomical changes, disease progression, or to study therapeutic efficacy. 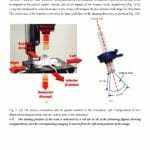 Image guided needle injections may be of interest to some researchers hoping to inject cells or other compounds into a very specific anatomical target with higher accuracy. Sonoporation may be of interest to those studying drug and/or gene delivery in specific targets. B-mode imaging can be used to image the developing embryo from early gestational time points to confirm pregnancy, through to full term gestational ages. A variety of anatomical structures may be identified in the brain, thoracic, and abdominal cavities. Color Doppler may be used to assess cardiovascular development, while PW Doppler may be used to quantify blood flow velocity in the heart and some large vessels, depending on the gestational age. M-Mode may be used at later gestational ages to study the movement of the heart ventricles. Due to the non-invasive nature or ultrasound imaging, longitudinal studies may be conducted on the same animal to monitor growth, development, and anatomical change. 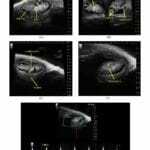 Image guided needle injections may be of interest to some researchers hoping to inject cells or other compounds into a very specific anatomical target within the developing fetus. 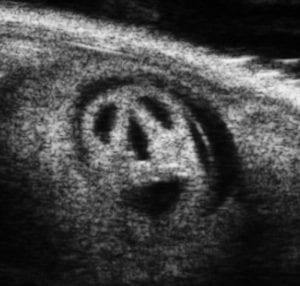 B-mode imaging can be used to identify a variety of anatomical structures within the eye of a variety of species, including the cornea, iris, and other superficial targets. The deeper structures of the eye, such as the retina may be imaged depending on the size of the eye. Color Doppler may be used to assess flow through the retina, while PW Doppler may be used to quantify blood flow velocity in the retinal artery. Contrast imaging can be used to assess microvascular flow, or targeted microbubbles may be used to detect specific molecular targets within the eye. B-mode imaging can be used to visualize the heart and a few other structures, including tumors, within the Zebrafish and other aquatic species. Two dimensional, real-time images, can be used to study cardiac function in a variety of models of heart regeneration. Color Doppler may be used to assess flow through the three chambered heart, while PW Doppler may be used to quantify blood flow velocities. Due to the non-invasive nature or ultrasound imaging, longitudinal studies may be conducted on the same animal to monitor tissue regeneration, tumor development, or to study therapeutic efficacy. B-mode imaging can be used to visualize the developing chick embryo by removing a portion of the shell where the air pocket exists. Two dimensional, real-time images, can be used to study cardiac development in this model. 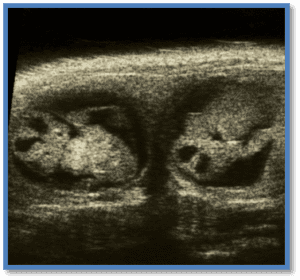 Due to the non-invasive nature or ultrasound imaging, longitudinal studies may be conducted on the same embryo to monitor development or to study an intervention. The 3D motor connects to the imaging platform to precisely move the animal bed with imaging subject under the probe. The acquisition software allows the user to select the distance the motor will travel and the step size. The acquired imaging slices are then reconstructed into a 3D image. The visualization and analysis software allows the user to move through the acquired image, view it as a 3D surface, and make volume measurements. Image guided needle injection is used accurately target an injection site, whether it be the myocardium, abdominal organ, vascular target, or structure within the developing embryo. The injection mount is attached to the probe to help ensure the needle remains in alignment with the imaging plane. The trajectory of the needle can be adjusted, and the needle is advanced manually into position while observing its position on a 2D B-mode image. The accessory may be used with either a standard syringe and needle, or pulled glass capillary auto-injector. Sonoporation is the controlled, and most often directed, cavitation or bursting of microbubbles with the intention of increasing the permeability of the cell membranes to a specific agent. Most often, sonoporation is performed with the intention of permeabalizing the cell membrane or opening the blood brain barrier to aid in the transit of drugs or genes into the cells or brain. The energy used to perform sonoporation is controlled to ensure cell permeabilization rather than cell death. The sonoporation probe is a secondary, non-imaging, probe which is directed to the region of the animal for sonoporation. The probe is connected to the Prospect T1 and the software interface allows the user to control many of the parameters associated with the application of the sonoporation events. Shear wave elastography is a technique used to study and quantify the mechanical and elastic properties of various tissues including liver, breast, tendons, muscles, etc. An acoustic radiation force is generated by a secondary, non-imaging, element mounted on the side of the imaging probe. The software is used to program the pulse sequence to generate the shear wave; the wave will propagate faster through stiffer tissues, as well as along the axis of various musculoskeletal structures. The analysis software generates a colored elastogram which is overlaid upon a B-mode image. Tissues with focal of diffuse lesions may be identified using this technique.